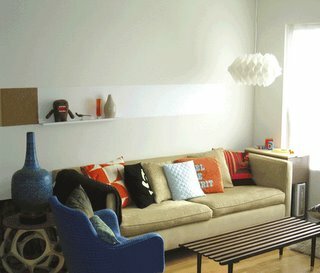 Refab:clinc is a fun place to browse for "happy vintage modern furnishings" that cover the 50s, 60s, 70s, and 80s. They feature a small inventory of items that they'll most likely never feature again, so if you like something you see, grab it quick. If you're looking for something that they don't carry, email them, and they'll let you know if they find it. I want the hanging light and the bee hive style end table in this photo, but surprise! It's already gone! See what I mean...you have to act fast.